Shadows show severe damage from M-carbon. (Phys.org) -- A Yale-led team of mineral physicists has for the first time confirmed through high-pressure experiments the structure of cold-compressed graphite, a form of carbon that is comparable in hardness to its cousin, diamond, but only requires pressure to synthesize. The researchers believe their findings could open the way for a super hard material that can withstand great force and can be used  as diamond-based materials are now  for many electronic and industrial applications. The study appears in Scientific Reports, a Nature journal. Under normal conditions, pure carbon exhibits vastly different physical properties depending on its structure. For example, graphite is soft, but diamond is one of the hardest materials known. Graphite conducts electricity, but diamond is an insulator. In the middle is the form of carbon confirmed by the Yale-led team, dubbed M-carbon and predicted by theoretical methods initially in 2006. M-carbon is made when graphite is compressed to pressures approximately 200,000 times room pressure, at room temperature. Although changes were first observed in graphite under high pressure and room temperature conditions 50 years ago, it is only now that the crystal structure has been confirmed by experiment, using long duration x-ray diffraction, Raman spectroscopy and optical techniques to verify these predictions. Besides the unique mechanical properties discovered in M-carbon, we find that the transformation of graphite to M-carbon is extremely sluggish and requires a long time to reach equilibrium, which may be the additional reason why this puzzle remained unsolved for the past half century, said Yuejian Wang, the studys first author and former postdoctoral researcher at Yale, who is now assistant professor of physics at Oakland University. Researchers say this intermediate structure has much lower symmetry than diamond, but is as hard. In fact, Our study shows that M-carbon is extremely incompressible and hard, rivaling the extreme properties of diamond so much that it damages diamond, said principal investigator Kanani K.M. Lee, assistant professor of geology and geophysics at Yale. Other authors are Joseph Panzik of Yale, and Boris Kiefer of New Mexico State University. The study was supported by grants from the Carnegie/Department of Energy (DOE) Alliance Center and by national synchrotron facilities supported by the DOE, National Science Foundation, and the W.M. Keck Foundation. If it damages diamond, then it obviously went beyond the crystalline phase of diamond. Diamonds would therefore be easier and less time-consuming to manufacture than M-carbon, or would it? Doesn't matter. 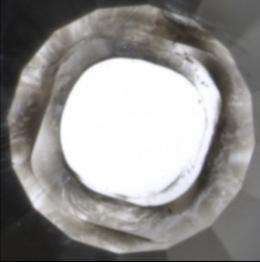 Diamond is stable at low temperatures and pressures, the new M-carbon state, and an intermediate H-carbon state decay rapidly at low pressure. What is the distance from the Laboratory to the Factory? How long must Graphite be held at high pressure, to 'transform'? For making in quantity, what are the size limits of pressure chambers? What are the costs of attaining such pressures?